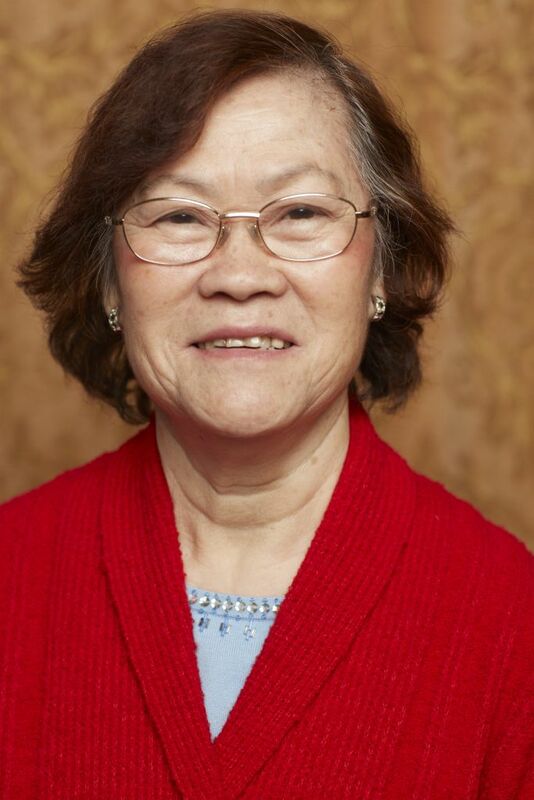 Born 1945 in Macau, Duen Yee Lam’s family moved to Hong Kong when she was ten years old . She is one of five children, and often had to take on adult responsibilities when she was 12 and 13 years old, taking care of her brothers and working to help the family. In the 1960’s she worked in electronics factories doing assembly work on small radios. Later she worked at a custom tailor shop where she learned sewing skills and the ins-and-outs of the fashion industry. Her husband worked in a knitting factory. They met and married in 1968. She made all her own clothes, and later clothes for her three daughters (born in 1969, 1971, 1977). She passed exams to get work in large sewing factories in Hong Kong, with good benefits and pay, as well as numerous activities for the workers. After her children were born, she took sewing home, and worked at home on garments, and later embroidered flowers and fancy decorative trimmings. Later she got a job as a fruit and vegetable vendor, work she could do around her children’s school schedules. She was always working to support herself and the family. She always saved money for any emergency, and the family enjoyed a secure life in Hong Kong. The decision to immigrate to the U.S. was very difficult. Her husband’s family was in America, and petitioned for them to come. She and her husband and three girls were comfortable in Hong Kong, and being close to 40 years old, they hesitated to start all over again. The decision was postponed and postponed. The U.S. government was ready to cancel their immigrant visas. Her husband left the hard, final decision to her, and she decided to move the whole family to the USA. There were two main reasons: (1) for a brighter future for her children, and (2) for the opportunity for her husband to be with his siblings in the U.S.
After arriving in New York, she put the kids into public schools in Brooklyn near home, and got a job in a sewing factory in Manhattan’s Chinatown. She got a lot of important information about housing, schools, and jobs from relatives and the Chinese radio. She worked in a unionized factory with good benefits. Her husband worked for a construction company doing home renovations, based on work experiences on subway construction projects in Hong Kong. They lived in a Brooklyn apartment for ten years, then applied successfully for a co-op apartment (Mitchell Lama) where she still lives now. Over time, her housing, jobs, health care and children’s schooling were secure and fine. Duen Yee was always a reliable, hard worker. She worked steadily in the Chinatown garment factory until there was not enough work and she collected unemployment benefits for the first time (1989). The Union was offering a sewing skills class, and she signed up. The class graduation showed off the clothes produced in the class. After the class, she landed a supervisor job at a new factory managed by Hong Kong business people producing ladies’ pants for Liz Claiborne. (The shop lasted for 3 years, then closed.) She always worked very hard and fast, and she was capable and helpful to others. She could understand and operate every special machine, and loved sewing work. Her attitude as a supervisor (still a union member, not the factory boss) was always reasonable and fair. She did not yell at workers, fight or hold grudges. She saw a lot of conflicts among workers in factories. For example, when there was good work in the shop, workers would fight over the bundles – to get more work, and therefore more pay, especially on the easy projects (which Chinese workers called “soy sauce chicken”-as contrasted to the difficult projects, that were called “hard pork bones”). One day two workers were fighting over the bundles, and started threatening each other with scissors, ready to fight. Everyone in the factory, including the boss, stopped to watch, but nobody stepped in to stop the conflict. Finally, Duen Yee scolded the workers, “You spent all your hard earned savings to come to America – for what?? To hurt each other, fight, get reported to the police…why? Show a little respect!” This finally calmed everyone down. The co-workers, and employers, have always respected Duen Yee for being sensible, reliable, and peaceful-and still very strong. She has created a warm and loving family environment, while teaching them about all the ups and downs they would face out in the world. In the factory, she saw parents bringing their children to work because the children told them there was no school. The parents did not know…maybe there was an exam, and the kids did not want to go to school. She always checked up with the school and her children to make sure of their work and progress. The three daughters are very close, and they always looked out for each other. When she would try to punish one of them, the other two would try to talk her out of it, offer her tea or nice words to distract her. One of her daughters entered school in New York in the 5th grade, not knowing English and very new. The teacher asked a Chinese classmate to be her friend, but this classmate was a bully. She made her carry books and bossed her around. One day, her daughter came home with big red marks on her cheek. The girl had slapped her for refusing to do something she wanted. Duen Yee said she can still see the mark of the bully’s hand on her daughter’s face when she thinks about this incident. She felt it was important to be strong, determined and forward looking – don’t look at the past, don’t show regrets to your family. Her husband’s construction work was very harsh and physically strenuous. Most of Duen Yee’s relatives were in Hong Kong, much too expensive to call on the telephone in those days. She got a video recorder, but every time she started to tape a message to them, she would break down and cry. She had to support and encourage her children, even when they were bullied in school…teach them not to make or get into trouble. It made her heart ache, but she managed to move forward. She never had much schooling, and doesn’t read or write Chinese well. One of the hardest things she did was to take a Civics class with the union to prepare for the US citizenship exam. Her boss scolded her for leaving work early to attend night classes. She really wanted to become a citizen to sponsor her youngest brother to come to the US. It was a big pressure on her, and she was very happy when she finally succeeded. After the September 11 tragedy, many Chinatown garment factories were in the downtown “frozen zone,” and closed down one by one. Duen Yee took job training classes to get certificates as a home care worker. She did this work for eight years, taking care of six different seniors. Some of the seniors were demanding. After she wiped down the table, the senior would run his hands over it to point out all the spots that were still sticky. One would watch her chopping onions or other vegetables, and tell her to cut them a certain way. Another would ask her to wash and rinse laundry 5-6 times (by hand). She would always talk with them and ask why and explain her methods. The senior who needed his laundry rinsed many times had serious skin allergies. Duen Yee had good “people skills” and was able to win the trust and cooperation of her seniors. After retirement in 2014, she has helped to babysit four grandchildren. Her spouse helped out during his last years. Duen Yee enjoys her life in retirement, going to the senior center and sharing experiences from all her jobs and other activities with many old friends and relatives. She sings Chinese opera and practices the songs at home. She feels like there’s not enough time to do everything she wants to do! Looking back on all her jobs, she loved working in the sewing factories the most. She knew all the machines and how to check and get the garments ready to ship out. She is happy and proud that her daughters work hard and carefully like her.